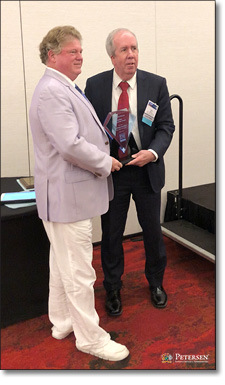 On October 23rd 2018, Thomas Petersen, Vice President of Petersen International Underwriters, was awarded the W. Harold Petersen Lifetime Achievement Award by the association board and members of the International DI Society at their annual conference which took place this year at the Marriot St. Louis Grand in St. Louis, Missouri. Tom was in attendance with his loving wife, several of his employees and many more friends and colleagues. Tom is the 14th recipient of the prestigious award (his recently-retired father being the first recipient and the award’s namesake) which was created to honor those who have dedicated their lives and careers to the promotion, growth and stability of the disability insurance industry in the U.S. and abroad through education and awareness. Tom Petersen completely embodies that ideal. He began his insurance career in 1986, specializing in the outside sales and marketing of supplemental, high-limit and international disability insurance products for the multi-generational firm, Petersen International which he has helped grow into the largest American personal accident Coverholder for Lloyd’s of London. Additionally, Tom has taken on new roles in the industry over the past 12 years, working tirelessly to significantly expand the market for disability insurance by successfully promoting and overseeing regulatory changes in 11 states that now allow excess DI to be written through the surplus lines market where it was previously prohibited. Working closely with industry trade groups, producer groups, lobbyists and state legislators, he has led the drafting of the required changes to existing regulations in each of those 11 states, opening the disability market for individuals and groups previously denied access to much needed insurance product lines. These legislative changes made DI accessible to all of the residents of those states where legitimate coverage was previously unavailable for both personal and business disability platforms. Congratulations Tom! Here’s to many more years of your help and influence to make the American disability market a force to be reckoned with.